The 10ths Hussars was stationed at Potchefstroom, South Africa when Britain declared war on Germany on 4 August 1914. The Regiment was recalled to Britain where it joined the 6th Cavalry Brigade, 3rd Cavalry Division. The 10th Hussars landed at Ostend, Belgium on 8 October 1914 and transferred to 8th Cavalry Brigade, also part of the 3rd Cavalry Division on 20 November 1914. The Regiment was transferred back to 6th Cavalry Brigade, 3rd Cavalry Division on 12 March 1918. The 10th Hussars served on the Western Front for the duration of the war. After landing at Ostend, the Regiment moved to Ypres where it would take part in the First Battle of Ypres. With the establishment of trench warfare, the Regiment couldn’t be used in a traditional cavalry role for most of the war. However, the 10th Hussars was rotated in and out of the front line trenches and suffered a constant stream of casualties. The 10th Hussars took part in the Second Battle of Ypres and suffered heavy casualties on 13 May 1915. These casualties amounted to 138 officers and men and included Lieutenant-Colonel Eustace Robert Ambrose Shearman. The rest of 1915 and 1916 was fairly uneventful for the Regiment. The next major engagement for the 10th Hussars was the Battle of Moncy Le Preux, on the opening day of the Battle of Arras on 11 April 1917 where the Regiment suffered 189 casualties. Very little occurred during the next year, as the 10th Hussars was mostly billeted away from the front line. On the 21 March 1918, the German Spring Offensive began and the Regiment was engaged. During 1918, the 10th Hussars also took part in the Hundred Days Offensive and suffered 70 casualties during the attack on the village of Honnechy on 9 October 1918. This attack would be the last occasion in which the Regiment suffered significant casualties during the war. The 10th Hussars was at Leuze, Belgium when the Armistice came into effect on 11 November 1918. 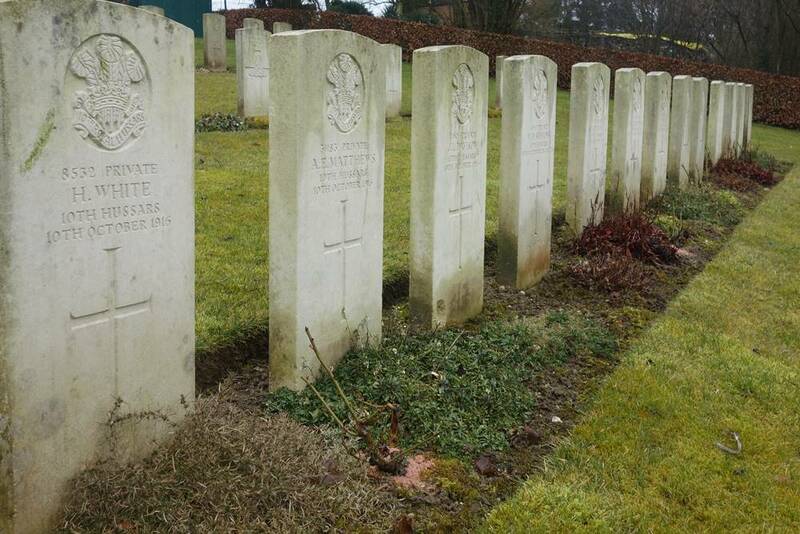 Seven soldiers of the 10th Hussars are buried in the Aveluy Communal Cemetery Extension, near Albert on the Somme. All seven soldiers were killed on 10 October 1916, 9 October in the war diary, while working as part of a dismounted party. Officers: There’s usually a lot of information available for cavalry officers and you should first check to see if they have a service record available at the National Archives. I offer a copying service for these records. 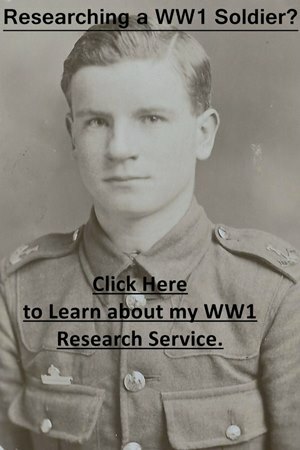 If an officer served past April 1922 then their service record will still be with the Ministry of Defence and I have an article about ordering these records on my Second World War website: Ordering a Service Record from the MOD. You will need to look at both the regimental history and the war diaries as these frequently mention officers by name. The regimental history contains a list of officers who served with the 10th Hussars which records when they joined and departed. If they were killed or wounded this was recorded along with the date. The regimental history also contains a list of awards. Other Ranks: A service record is key and if a soldier served past January 1921 then this record is still kept by the MOD. The regimental history contains a list of other ranks who became casualties and who were also awarded decorations. Other ranks are also frequently mentioned in the regimental history. If you know a soldier’s regimental number then you can often work out an enlistment date even if their service record hasn’t survived. There are medical sheets for the Regiment in MH 106/2197 and these often contain a wealth of information if your soldier’s documents are amongst them. To research a soldier who served in the 10th Hussars you’ll need to use both FindmyPast and Ancestry as they both have different record sets. Both sites offer a free trial and clicking on the banner below will take you to FindmyPast. There are three war diaries for the 10th Hussars and they have all been digitized by the National Archives. To download the war diaries for a small fee click on the blue links below. I have transcribed some extracts from October 1914 at the bottom of the page. Notes: A good war diary with detailed entries for when the 10th Hussars are in action. There are a few appendices including a list of casualties sustained by the 10th Hussars on 13 May 1915 which include the recipient’s squadrons. Notes: A good war diary though the post-war months only contain monthly summaries rather than daily entries. There are no appendices. Notes: A short war diary with brief entries. The regimental history has also been reprinted by the Naval and Military Press. 12 October 1914: Marched to Roulers and billeted. Brigade joined by “C” Battery Royal Horse Artillery. 13 October 1914: Marched to Ypres, halted, and then proceeded to Cheluvelt, Dadizeele, and Ledeghem. “A” Squadron to Rolleghem Capelle and billeted. German troops reported as follows: 1 Bavarian Cavalry Division at Warneton, 20,000 all arms at Tournai, and 20,000 all arms at Hazebrouck. Heavy battle reported at Lille, and Germans bombarding that town. The 6th Cavalry Brigade occupied protective line as follows: Ypres to Warneton, Zillebeke, Combines, Becelaere to Werviez. One man wounded and captured near Combines whilst on Officers’ patrol under Lieutenants Wilson and Earl of Airlie. 14 October 1914: Left Ledgehem for Ypres, Kemmel. Left half-squadron at Ypres to guard exit of town; brought down German Taube aeroplane outside Ypres, rounded up German patrol near Kemmel marched to Wyschaete and billeted. 15 October 1914: Half-Squadron re-joined from Ypres and were fired on by Germans, 3 men wounded. One troop of “C” Squadron sent to Zandvoorde in support of armoured car, killed one German, but had to retire to Hollebeke, thence to Wytschaete. Remainder of “C” Squadron sent to support the troop but failed to meet them, but had brushes with the enemy and took 2 officers and 3 men prisoners, and killed 8. The Regiment less “A” Squadron left Wystchaete and bivouacked 2 troops of “B” Squadron at Hollebeke, 2 troops at crossroads one mile west of Houthem. Headquarters, Machine Gun, and “C” Squadron at crossroads east of Costlaerwe, and acted as line of defence for brigade; 3 men wounded. 16 October 1914: Brigade concentrated at St. Jean, Ypres-Polecapelle road, and marched to Polecapelle to act as reinforcement to 7th Cavalry Brigade; returned from Polecapelle and spent night three-quarters or a mile east of Zonnebeke. 17 October 1914: “A” Squadron reconnoitred via Becelere and Dadizeele to Menin-Roulers Road “C” Squadron via Moorslede to Menin – Roulers Road, “B” Squadron Headquarters and Machine Gun remained East of Zonnebeke ready to reinforce squadrons if required. “A” and “C” Squadrons rejoined at noon. “B” Squadron patrolled district about Menin and Roulers for any of the large body of the enemy, returned about 5 pm. “A” Squadron lost 3 men wounded, 1 badly (had to be left at village). Billeted at Zonnebeke. 18 October 1914: Two troops of “C” Squadron picqueted the road leading to Zonnebeke South of Ypres-Moorslede road. Regiment marched to Paschendale and billeted. 19 October 1914: Concentrated at Moorslege at 7.30 am and advanced East. The Regiment Legeghem, “A” Squadron advanced Guard, “B” Squadron, 1 troop, Baggage Guard; 3 troops at St Pieters as support. The Regiment marched West and South of Legeghem and drove enemy to outskirts of village, “A” Squadron galloping the right of it. Enemy reinforced strongly, and Brigade was ordered to retire towards Moorslege at 2.30 pm; 3 men wounded. Captured 2 German prisoners. “A” Squadron remained at Paschendale, “B” Squadron at Spreit, “C” Squadron, Machine Gun and Headquarters at Polecapelle. 20 October 1914: Brigade concentrated at Westroosebeke early morning and took up defensive line with 7th Cavalry Brigade and French Cavalry and Territorials, running South from Westroosebeke: commenced to retire about 12.30 pm on to Langemarck. About 11 pm Germans made night attack, and Regiment had to retire, retiring again about 2.30 am next morning. Captains Gibbs, Fielden, Lieutenants Chaplin, Bouch and one other rank joined. 21 October 1914: Regiment marched to Ypres at 4.30 am concentrated with Brigade, and proceeded to Hooge on Gheluwe Road. Halted there till 2 pm, then proceeded to bridges over canal north of Hollebeke, held them and attacked chateau South-East of bridges in conjunction with 4th Hussars (3rd Cavalry Brigade). Or guns shelled the chateau until dark, therefore impossible to take it on that account. An officers’ patrol at 10 pm under Lieutenant Drake found it still held by the enemy. Regiment then proceeded to Zandvoorde and took over defensive line from Scots Guards; going into the trenches at 3 am. Horses were ringed in the town.